BRYAN EATON/Staff photo. 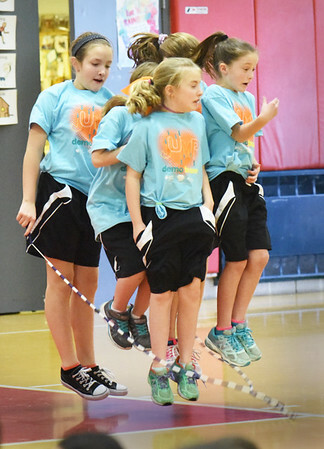 Students from Londonderry Elementary School in New Hampshire have a jump rope team named the Hip Hoppin’ Hawks that perform and spread the positive health message about fitness and nutrition. They were at Amesbury's Cashman School to get excited about their upcoming Jump For Heart Event spearheaded by physical education teacher Ted Flaherty. They have raised thousands of dollars for the American Heart Association through the years from that event.